KSRealityBites: Red Bull = Slow Death! Red Bull = Slow Death! RED BULL, an energy drink is sold in all the supermarkets in our country & our children are consuming it on a trial basis, it can be mortal! Stay Away from this drink, It's NOT SAFE for health! RED BULL was created to stimulate the brains in people who are subjected to great physical force and in stress coma & never to be consumed like an innocent drink or soda pop. All this can be found in a can of RED BULL, the power drink of the millennium. Red bull has managed to arrive at almost 100 countries worldwide. The Red bull's logo is targeted at young people & sportsmen, two attractive segments that 've been captivated by the stimulus that the drink provides. It was created by Dietrich Mateschitz, an industrialist of Austrian origin who discovered the drink by chance. It happened during a business trip to Hong Kong , when he was working at a factory that manufactured toothbrushes. The liquid, based on a formula that contained caffeine & taurine, caused a rage in that country. Imagine the grand success of this drink in Europe where the product still did not exist, besides it was a superb opportunity to become an entrepreneur. The TRUTH about this drink is another thing: FRANCE & DENMARK 've just prohibited it as a cocktail of death, due to its vitamin components mixed with GLUCURONOLACTONE, a highly dangerous chemical which was developed by the United States Department of Defense during the sixties to stimulate the moral of the troops based in VIETNAM, which acted like a hallucinogenic drug that calmed the stress of the war. But their effects in the organism were so devastating, that it was discontinued, because of the high index of cases of migraines, cerebral tumors & diseases of the liver that was evident in the soldiers who consumed it. It is dangerous to take it if you do not engage in physical exercise afterwards, since its energizing function accelerates the heart rate & can cause a sudden attack. You run the risk of undergoing a cerebral hemorrhage, because Red bull contains components that dilute the blood so that the heart utilizes less energy to pump the blood, & thus be able to deliver physical force with less effort being exerted. 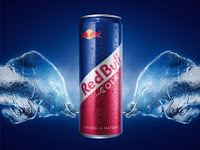 It is prohibited to mix Red bull with alcohol, because the mixture turns the drink into a " Deadly Bomb " that attacks the liver directly, causing the affected area never to regenerate anymore. One of the main components of Red bull is the B12 vitamin, used in medicine to recover patients who are in a coma; from here the hypertension & the state of excitement which is experienced after taking it, as if you were in a drunken state. The regular consumption of RED BULL triggers off symptoms in the form of a series of irreversible nervous & neuronal diseases. CONCLUSION: It is a drink that should be prohibited in the entire world as when it is mixed with alcohol it creates a TIME BOMB for the human body, mainly between innocent adolescents & adults with little experience. Believe me "YOU CAN STAY HEALTHY IF YOU STAY AWAY FROM RED BULL! !